Walk-in closet. Old, interesting architecture. In French Quarter, but not close to noisy, dirty Bourbon st. The property was very quaint and the staff was super. Great location! Wonderful bar area for conversation. 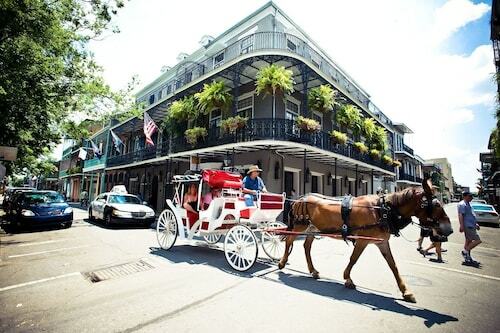 Overflowing with history, elegance and excitement, you will find the French Quarter located in New Orleans. It encompasses half a square mile of eye-catching, European -influenced buildings, many with balconies and galleries that are accented with elaborate ironwork trim. The Quarter 's stretches of quaint shops and art galleries, fine dining establishments, cafes and hotels can be easily traversed by foot, bicycle or horse-drawn carriage. The district is a prime destination for business travelers headed to conferences at the Morial Convention Center, families looking to take in some of the abundant live music in the "birthplace of jazz," and young revelers who want to live it up on Bourbon Street, the city's infamous party venue where anything goes. Because the neighborhood is New Orleans' oldest, history buffs will find plenty of things to do in the French Quarter. On the edge of Jackson Square, right next to the grand St. Louis Cathedral, sits the Presbytere, part of the Louisiana State Museum. The site houses a Hurricane Katrina exhibit, and you can also learn about the history of Mardi Gras. Although it sits just on the edge of the French Quarter, Louis Armstrong Park feels miles away from the hubbub of Jackson Square and Bourbon Street. The secluded, beautiful park is dedicated to the memory of Louis "Satchmo" Armstrong, and it's a wonderful place to relax in the shade, take in the sight of marvelous fountains and feed some ducks. In the spring, the roses on the edge of the park all blossom simultaneously in a kaleidoscope of dazzling colors: reds, whites, pinks and yellows. Families will love the Audubon Insectarium and Butterfly Garden on Canal Street, where visitors can feel at one with nature. Explore Louisiana swamps, see the world from the vantage point of an ant, and feel as though you've been transported to a magical land in the Asian garden, where you'll be surrounded by colorful butterflies and maybe even get to touch one. Fans of street music and undiscovered artistic talent won't be disappointed in the French Quarter, where every day means musical performances, magicians, sword swallowers and even poets. Have a mystic read your fortune with tarot cards to see what your future holds, or pick up a personalized portrait or silly caricature as a souvenir token, drawn on-site at Jackson Square. There's no shortage of French Quarter hotels in this New Orleans getaway, with its historic buildings steeped in elegance and traditional décor. Fans of the mysterious and paranormal may want to lodge at the Hotel Monteleone, often touted as the city's most haunted. 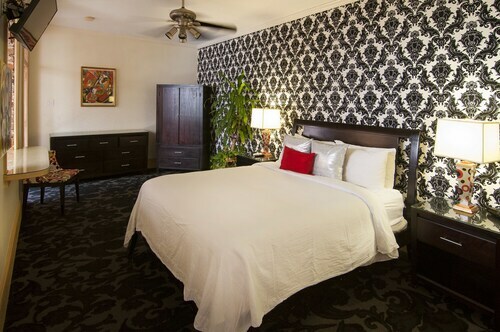 More notable accommodations include the Royal Sonesta and the Hyatt French Quarter. Be aware that nightly rates are prone to increase during Mardi Gras, because the Quarter is the place to be every year on Fat Tuesday. The French Quarter is a bustling neighborhood year-round. Mardi Gras is, of course, a New Orleans trademark that occurs every February or March and is an entire season rather than a single day, but travelers are likely to run into a special event no matter when they choose to visit. One of the most fun events in the city is San Fermin en Nueva Orleans, held every July. A Cajun twist on Pamplona's Running of the Bulls, San Fermin brings thousands to the streets dressed in white and red; instead of bulls, runners are chased by members of New Orleans' roller derby league who carry foam bats. Summers in Louisiana can be hot and muggy, but the summer nights are cool, and the streets tend to be less crowded. During spring, just after Mardi Gras, the French Quarter really shines. The street performers come out of their winter hibernation, flowers bloom everywhere, and you can walk around all day, beignet and café au lait in hand, in perfect mid-70s temperatures. The staff was fantastic! The rooms were clean and very comfortable to stay in.